Name of your sending organization: Fellowship International Mission. Number of years serving on the mission field, at home and / or abroad: Not Avilable. Name of the states or countries where you have served: Thailand / Pennsylvania. Year Calvary Bible Church began their support to you: 2007. Focus of your missionary activities (church planting, translation, medical or other): Through the distribution of the Project 316 handheld audio players, their desire is to make the Gospel and the teachings of God’s Word available to the Hmong throughout Southeast Asia. By providing the Hmong believers with these teachings, as well as giving them a tool to share the Gospel with others, the Zeeks hope to equip Hmong Christians with all the knowledge necessary so that they can become fully developed, authentic, evangelistic, disciples of Jesus Christ. 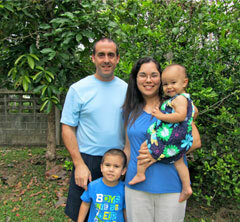 Missionary family, include all family members serving with you: Mike, Sonja, Sinjin and Mikaela Zeek. Activities in which your family members participate: They also have a passion to provide believers with the biblical knowledge that is necessary so that any believer can be involved in “church planting” ministries whether in their home community or abroad. Your home church or sending church: They are originally from the greater Philadelphia area, and have been commissioned by Berean Bible Church in Pottstown, PA as missionaries to the Hmong people of Southeast Asia. Copyright (c) 2015 Calvary Bible Church Lapeer. All rights reserved.